The Association of Chartered Certified Accountants (ACCA) has presented a certificate of accreditation to the University. 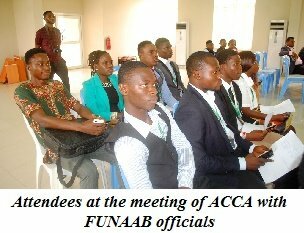 With the feat, FUNAAB has become the first and only federal university in Nigeria to be ACCA-certified. Speaking on the procedure, which led to the accreditation, the Acting Head, Department of Accounting, Dr. Sunday Kajola, disclosed that over a year ago, representatives of ACCA Nigeria visited the Department for possible collaboration in the training of professional accountants and students. However, before the recognition could be given to the institution, the Bachelor of Science (B.Sc) Accounting programme had to be evaluated by the ACCA head office in the United Kingdom. According to him, the programme’s structure and past examination question papers were submitted for the evaluation exercise and had turned out successful, which had resulted into the certification being given to the University. Highlighting the benefits of the certification and collaboration, Dr. Kajola disclosed that ACCA Certificate had global acceptability, as holders of the certificate can practice as accountants anywhere in the world while the University would be listed among the international affiliated institutions of ACCA, which comes with an added premium over other institutions in Nigeria, running the accountancy programme. The Department, through the Association’s corporate social responsibilities to its affiliated institutions, could benefit from the provision of study texts, modern teaching aids, computer hardware, accounting software, exchange programmes, workshops and training of accounting lecturers. Presenting the certificate, the ACCA Education and Learning Manager (Nigeria), Mr. Victor Ayoola, lauded the curriculum content of the Department of Accounting, which he said cumulated in the international accounting body, accrediting the Department and approving a waiver of seven courses out of the 14 courses to be taken by students for the ACCA professional certification. He stated that seven-course waiver was unusual at first attempt, adding that FUNAAB was the first University in Nigeria to get seven exemptions, at its very first attempt. According to him, ACCA, which was established in 1904, had over 198,000 fully qualified members and 486,000 students worldwide, noting that “ACCA members are among the world’s best-qualified and most highly sought-after accountants and can work in every sector you can imagine”. 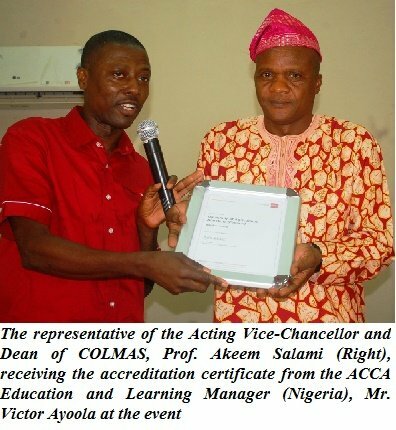 The Acting Vice-Chancellor, Professor Ololade Enikuomehin, who was represented at the occasion by the Dean, College of Management Sciences (COLMAS), Professor Akeem Salami, acknowledged the ACCA accreditation, which he said was an indication of the University’s commitment to producing competitive and industry-ready graduates in line with its vision while assured the ACCA team that the University would not water down on its standards, but would be open to innovations.